Manchester United look to keep the good times rolling under Ole Gunnar Solskjaer as the Red Devils take on AFC Bournemouth at Old Trafford. The holiday fixtures are coming thick and fast for Manchester United, who look to keep the positive momentum going after the arrival of Ole Gunnar Solskjaer as interim manager. The Norwegians next test comes on Sunday, as United host AFC Bournemouth at Old Trafford in a game that could be tricky for the Red Devils. The teams come into the matchup in contrasting form. United have experienced a renaissance of sorts after firing former coach Jose Mourinho and bringing in club legend Solskjaer. The Norwegian has had a near perfect start to life in the Old Trafford dugout, smashing Cardiff City and Huddersfield by a combined score of 8-2. The mood has greatly improved in Manchester, and fans are finally excited to see the Red Devils take the pitch once again. “When you win, everyone is happy, so let's just keep that run going," said Solskjaer. "We've got to focus on our performance against Bournemouth and get three points because the last two games have been fantastic." For Bournemouth, times haven’t been as good, but that’s mainly down to their tough schedule in the past few weeks. They’ve lost eight of their last ten games, but six of those were against the “Big 6” of the Premier League. Even with their poor run of results, they sit in a comfortable 12th place, and are only two points away from a potential Europa League position. With a manager like Eddie Howe, they are in no danger of falling into a relegation scrap, and won’t have fear in facing a world powerhouse like United. “We'd love to elevate our position of course, we're still in control of what we do this season,” said Howe in his pre match press conference. "That's important and we're always striving to improve." United and Bournemouth did face off earlier in the season, with that match taking place at the Vitality Stadium on the 3rd of November. The Cherries would take the lead early on, with Callum Wilson scoring from close out when United failed to properly clear a corner. The away side would grab an equalizer before the end of the half, when Anthony Martial was able to get on the end of a low cross from Alexis Sanchez. The second half was a hectic affair, with both teams opening up in search of a potential winner. It would be United who grabbed the vital three points at the death, with Marcus Rashford smashing home a loose ball in the 92nd minute to win the game for the Red Devils. For the first time in a long time, United don’t have much to worry about when it comes to team selection. Chris Smalling will likely be the only man who will be forced out, as he has yet to recover from the injury he re-aggravated before the game against Liverpool. There are a number of attacking options set to return to the side, as Sanchez, Martial, and Romelu Lukaku should all be available to Solskjaer. 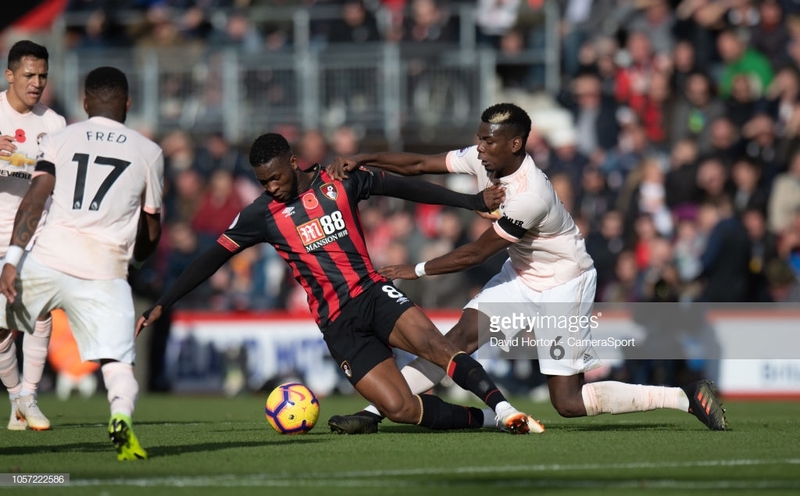 For Bournemouth, they’ve big hit a major injury blow as club captain Simon Francis is out for the rest of the season after rupturing his ACL on Boxing Day. The Cherries will also be without Adam Smith, Dan Gosling, and Lewis Cook, but have no further issues in terms of team selection. Can the resilient Cherries play spoiler once again? This, like every game played between the teams in the past, will be all about whether the Red Devils can break down a defensive Bournemouth team. The pressure will be on the home side to create chances and score goals, while the visitors will just look to lock up shop and potentially steal one on the counter attack. United have usually come out on top in the past, but it’s always been tough, as the Red Devils haven’t put three past the Cherries since the end of 2016. Early signs have indicated that Solskjaer has gotten the offense firing on all cylinders, but Sunday will serve as a tough test for the interim manager.